Spread across 5 floors, the Athens Metro Mall stores cover every need- Clothes, Accessories, Footwear, Toys, Opticians, Technology and Electronics, Sportswear, Banks, Entertainment centres, Cafes and Restaurants and a lot more. Most of the travelers who visit Athens are generally enamored of antiquity that the city holds for them. However, its always a good idea to explore the modernity of the city and this mall is a significant representative of that. Offering an urban environment, this mall holds something for all in its precincts. How popular is Athens Metro Mall? People normally club together Filopappos Hill and Garbi Restaurant while planning their visit to Athens Metro Mall. Yesterday i visited Athens metro mall, i had a pain at my neck and i was wearing sports tape, my doctor told me to keep the area warm so i had my hood on. One of the guards made me take off my hood for no reason! I have spent thousands on this mall this is such a shame! At least i am waiting a public sorry for them! Guys really do not visit that place Golden Hall is better both in attitude and items you can find! Comfortable shopping experience, parking is easy and well lit, nice food court options and of course the movie theater is great! 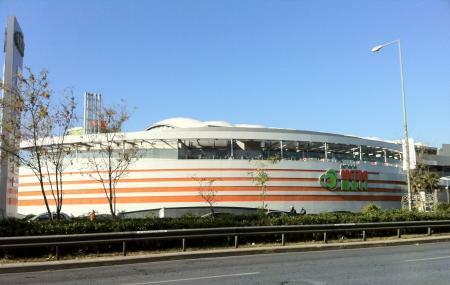 Best mall in Athens. Lots of stores, great prices, coffee shops with great view and also village cinemas inside. There are also mini games for children. Kinda small compared to 'The Mall' at Marousi but unrilvaled in this side if town and definitely has good options for everything you want - entertainment, food, coffee and shopping!